Coronado Lake, Colorado, a small resort town where people spend their summers boating, fishing and relaxing, until full moon rises and the carnage begins. As townspeople begin dying savagely, Police Chief Foley Kincaid and Dr. Thomas Burk try to find answers to stop the slaughter under the fangs and claws of a supernatural creature that knows only bloodlust and revenge. Douglas D. Hawk’s first novel, Moonslasher was a bestseller for Critic’s Choice Paperbacks. This new edition, issued by Raptor Mountain Publishing, is a re-edited and updated, but features the same terrifying story that will keep you awake at night and afraid of the dark shadows in the cool moonlight. 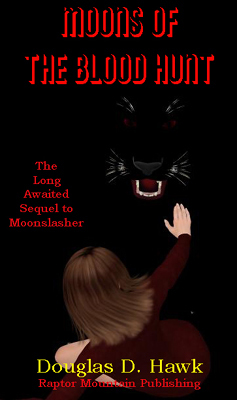 The long await sequel to Moonslasher, Moons of the Blood Hunt finds survivors of her relentless attacks again fighting Sekhet the Slaughter, the ancient Egyptian sun goddess. Cursed to walk in the light of the full moon, she preys on humans for her survival and she has now taken the battle from the Colorado mountains to the streets of Denver in a savage blood hunt as she pursues those who previously escaped her. CLICK HERE to go to the Kindle Store for Moons of the Blood Hunt. Only $2.99. “I crave flesh and blood…The gnawing in my belly is great. I need to be replenished.” The terrifying monster so artfully created in Moonslasher is back in Douglas Hawk’s fast-paced sequel, Moons of the Blood Hunt. It’s a stormy night, and a young doctor bicycling home from work takes the path along a creek to avoid splashing rain and speeding drivers. The way lies in shadows, but at least there’s no one to get in his way. Or is there? Quiet dread grows into fear and builds into run-for-your-life horror as this character lets the reader know bad things are going to happen in Denver. It’s just the beginning of the havoc that will be wreaked upon the city unless the people who have encountered the monster before can stop it. Doug Hawk is a skillful writer, creating memorable characters and ruthlessly subjecting them to the dreadful revenge of a creature none of them understand. Moons of the Blood Hunt is a fun read. Just make sure you’ve paid your electric bill: you do not want the lights to go out while you’re reading this one. — Yvonne Montgomery, author of Scavenger Hunt, Obstacle Course and The Wisdom Court Series. 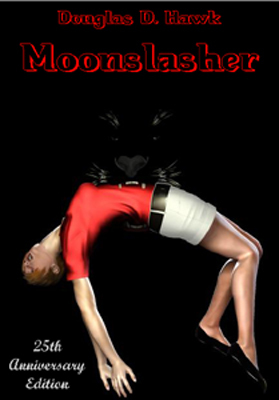 The long-awaited sequel to Moonslasher and I was NOT disappointed with the book! The wait was WELL worth it!!! Mr. Hawk writes in such a way as to make you want to see more of his work!